When given a malicious input it will cause the processing thread to go into an infinite loop. Update We have added a probe feature available to paid subscribers of HackMyCF which will alert you when you need to update your JVM. Any instructions on how to apply this patch to ColdFusion? Is Adobe going to release a patch as well? The instructions to apply the patch are here: http://www.oracle.com/technetwork/java/javase/fpupdater-tool-readme-305936.html there isn't much that would be different for ColdFusion server, you just need to make sure that you are updating the JVM that ColdFusion is using. Thanks for the response. What's best practice for updating the JVM? 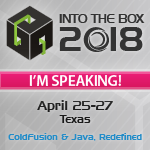 Using the standard JVM that was installed with ColdFusion and updating it or using the latest version which is installed separately? For example if ColdFusion was installed on D:\ColdFusion8 the default JVM path would be D:\ColdFusion\runtime\jre. Is it best practice to install each new JDK such as D:\Java\jdk1.6.0_23\ and use D:\Java\jdk1.6.0_23\jre as the JVM path? @Dave - I personally prefer to install the latest JVM from Oracle. The JVM that ships with CF (especially CF8) will have other security issues, though they may not be as easy to exploit as this one is. It's not as easy to trigger as I feared though. I just tried one of our remote-enabled CFC calls on the dev. CF9.0.1 system, and it's perfectly happy.